The Internet of Things (IoT) offers enhanced technology capabilities in diverse industries. In the health care setting, IoT will bring new connected medical devices that support near real-time monitoring of patient health information. In the transportation industry, connected vehicles will communicate securely with each other and with the environment surrounding them, offering safer commutes. In the Utility industry, energy consumption will be regulated more efficiently which will reduce the risk of grid overload. These are only a small set of examples that illustrate how the IoT will change the way we all interact with technology and with each other. Implementations of IoT vary greatly in the protocols that are used for communications and the security controls applied to their design. Examples range from devices that communicate using short range communications with smart phones, to entertainment components that are always connected to the Internet over your home’s wifi connection, to systems that communicate using proprietary protocols like ZWave. Many device types also communicate directly with each other (Machine-to-Machine). In some instances these communications are conducted over encrypted channels and in other instances that is not the case. Organizations looking to deploy IoT components within their infrastructure must be aware of the threats that are introduced along with those components and take proactive actions to mitigate those threats through a careful consideration of their Enterprise security architecture. 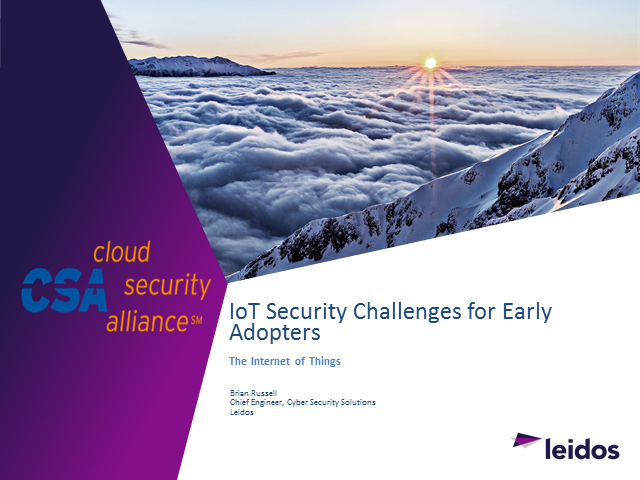 This talk will examine some of the challenges facing early adopters of the IoT which will be a focus of our first CSA document, providing industry guidance to help mitigate IoT Security Challenges for Early Adopters.